Calvatia gigantea (common synonym Langermannia gigantea), the Giant Puffball, can grow to 80cm diameter and weigh several kilograms. They are easy to spot, although from a distance they could be mistaken for sheep! It is almost pointless to go in search of these elusive but very conspicuous fungi unless you know of a site where they have appeared in the past. Just treat the occasional new find as a slice of serendipity and note the map reference! Calvatia gigantea is one of several fungi that have been used as a styptic dressing to stem the bleeding of wounds. For this purpose the puffball is cut into thin strips. Another use is as tinder - a means of carrying fire from one place to another in the days before matches had been invented. Smouldering lumps of this and other kinds of fungi were also used by beekeepers when they needed to tend their hives. The smoke from a smouldering Giant Puffball was used to calm the bees, thus greatly reducing the chances of a beekeeper being stung. The number of spores produced by one large fruitbody of Calvatia gigantea is measured neither in millions nor in billions but in their trillions - a trillion is a million millions. Thank goodness not all of the spores from a Giant Puffball result in viable mycellia that produce Giant Puffballs elsewhere, or we would soon run out of 'elsewheres' and have no room for anything else anywhere! 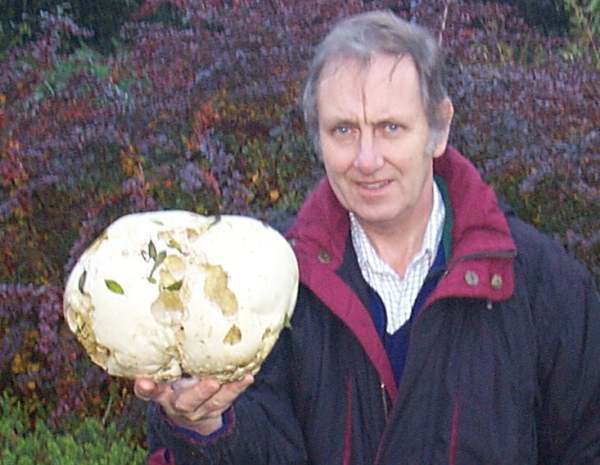 A localised and infrequent find in Britain and Ireland, Giant Puffballs occur also throughout mainland Europe, where they are common in some countries but rare in others. These massive fungi are also found in many other regions of the world including parts of North America and several countries in the southern hemisphere. Puffballs, earthballs, earthstars, stinkhorns and several other kinds of fungi were once thought to be related and were known as the gasteromycetes or 'stomach' fungi, because the fertile material develops inside spherical or pear-shaped fruitbodies. The gasteromycetes group of fungi is now known to be polyphyletic (not descended from the same single ancestor). Nevertheless, this is still considered by many authorities to be a useful grouping for study purposes, although there is no scientific justification for it. The various puffballs belong in the Agaricaceae, while earthballs are more closely related to boletes. For convenience, therefore, we have created a gasteromycetes gallery, in which you can find a wide selection of puffballs, earthballs, earthstars, stinkhorns and stalkballs, although the various species also appear in the galleries of their currently accepted taxonomic groups. Synonyms of Calvatia gigantea include Lycoperdon giganteum Batsch, Bovista gigantea (Batsch) Gray, Langermannia gigantea (Batsch) Rostk., and Lasiosphaera gigantea (Batsch) F. Šmarda. Surely the specific epithet gigantea needs no explanation, but where did the genus name Calvatia come from? It is derived from Latin and simply means 'a bald head or skull' - hence the Giant Puffball is described via its scientific name as a gigantic bald skull. Quite apt, don't you think? 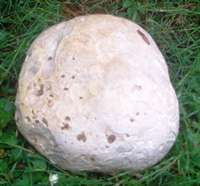 A large, slightly flattened irregularly globe-shaped fruitbody, initially white, the Giant Puffball has a lumpy and leathery surface; sometimes wrinkled near the base, where it is connected to the substrate by a root-like mycelial cord. Often the mycelial cord breaks, allowing the puffball to roll around in the wind and distribute spores widely once the outer skin has ruptured. Giant Puffballs are typically 10 to 80cm across, but exceptional specimens more than a metre in diameter have been reported. There is next to no sterile base section and no stem: virtually the whole of this puffball is filled with fertile spore mass, which turns from white to yellowish olive (as shown on the left) and eventually brown as the spores mature. More or less spheroidal, 4-5µm in diameter; surface smooth or more often ornamented with minute warts. Very faint, pleasant odour; no distinctive taste. 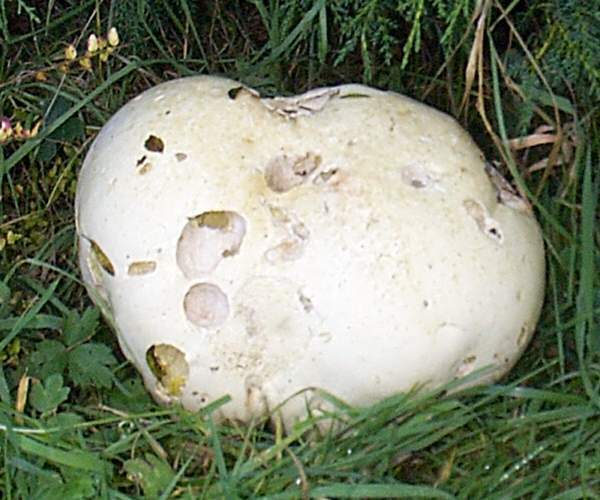 Saprobic, often found on roadside verges, at the edges of fields and among briars, nettles and other rank vegetation in nutrient-rich waste ground and on woodland edges; occasionally the Giant Puffball is found in open woodland or in woodland clearings. Usually Calvatia gigantea occurs in small groups, but Giant Puffballs have been known to form fairy rings. Handkea utriformis is much smaller, shaped like a vertically-squashed pear, and has a sterile base section. 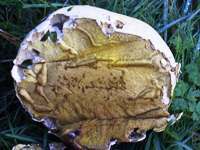 This is a very easy to recognise edible puffball and once fully developed it cannot reasonably be mistaken for any other mushroom. Unfortunately it's not every day that you stumble across Giant Puffballs, as they are not only uncommon but also very localised in their distribution. 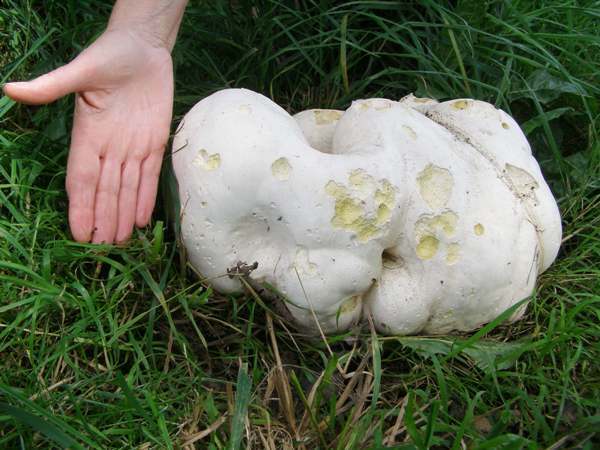 If you find a good spot for these mighty meaty meal sources, make a note of it because Giant Puffballs usually reappear in the same places for many years. Ensure that any Giant Puffballs that you gather for food are fresh and white throughout; they become inedible once the spores start to ripen and the flesh of the fruitbody turns greenish yellow or olive and eventually brown. 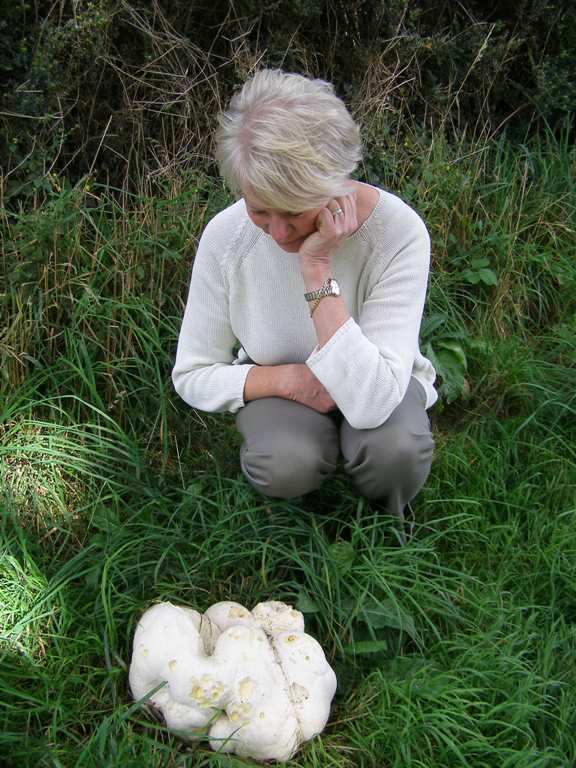 Giant Puffballs found growing on busy roadside verges are likely to be contaminated by toxins from vehicle exhausts, and so they are best avoided when gathering fungi to eat. As for recipes, puffballs are quite versatile fungi but not possessed of the strongest of flavours. For this reason they are often peeled and then cut into strips and cooked in casseroles with meat. Another recipe involves dipping strips of Giant Puffball into beaten egg, coating them in breadcrumbs and then frying them with a few strips of bacon. They can then be served either with a salad or with pasta. Puffballs are rather like tofu (soy bean curds), so you can always add a few strips of Giant Puffball to any other mushroom dish, including soups.